In a large bowl, combine sugar and mashed potatoes. Add water and yeast; mix well. Cover and let rise in a warm place 1 hour. Stir mixture down; beat in butter, eggs and salt. Gradually stir in flour. Turn out onto a lightly floured surface; knead until smooth and elastic, about 6-8 minutes. Divide dough in half. On a floured surface, roll each portion into a 12-in. square. In a small bowl, combine filling ingredients. Spread filling to within 1 in. of edges of each square. Roll up jelly-roll style. Cut each roll into nine slices. Arrange nine rolls in each of two greased 9-in. square baking pans. Preheat oven to 350°. Bake 35-40 minutes or until golden brown. 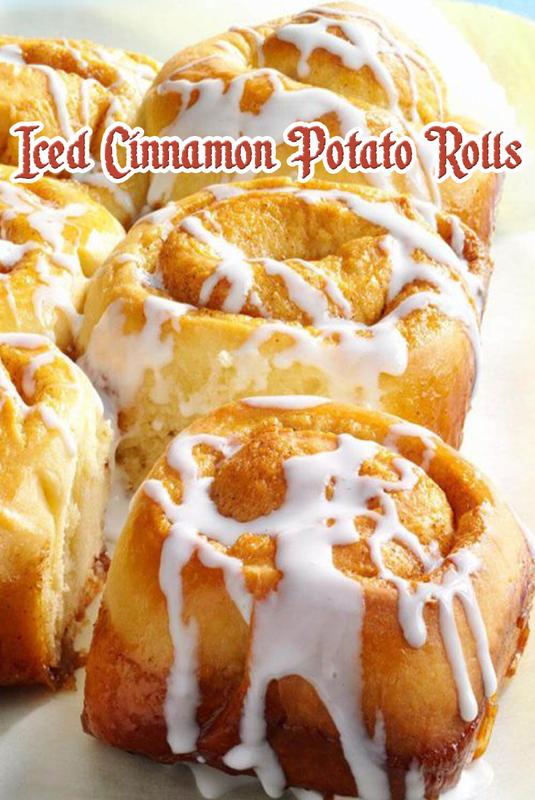 Combine icing ingredients and frost warm rolls. Freeze option: Cover and freeze unrisen rolls. To use, thaw in refrigerator overnight. Let rise, covered, in a warm place until doubled, about 1-1/2 hours. Bake and frost rolls as directed.